Virtually on the doorstep of the famous Smithfield Market, the Bishop’s Finger is in the perfect position to put fresh meat on the menu. Superb ingredients go into a wide range of delectable dishes, including tempting sharer boards, gourmet burgers, reinvented pub classics, speciality sandwiches and a range of irresistible tapas-style bar snacks. A great place for a meal out in Smithfield, the Bishop’s Finger can accommodate dining groups of all sizes. Small groups can book a table in the main bar, while sit-down dinners and beautiful buffets are available for private parties in the upstairs function room. The Bishop’s Finger is a Shepherd Neame pub, and indeed shares its name with one of the brewery’s classic ales. 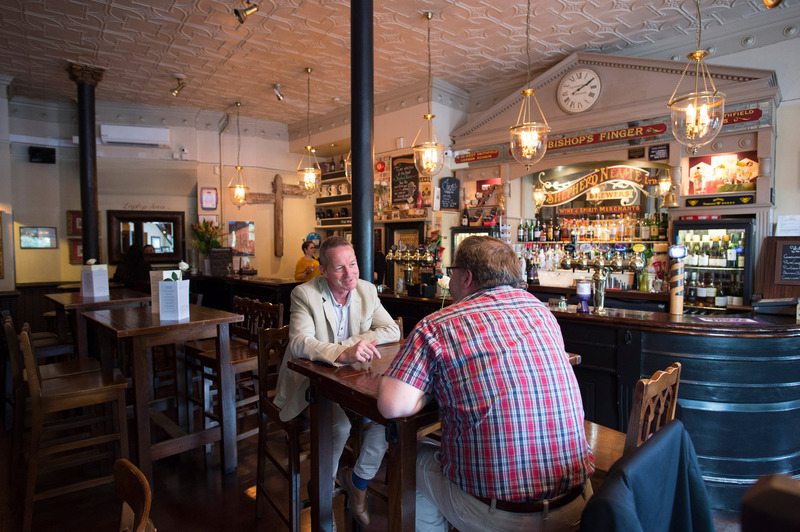 An excellent selection of the Kent-brewed ales and lagers are available at the bar, along with a fine collection of wines, spirits and soft drinks. The Smithfield Smithfield pork pie, Black pudding scotch egg, three sausages (choose form today's board), onion rings, crusty bread and onion chutney.